After the stress of my final university exams, my girlfriend and I treated ourselves to a 5-week trip to Indonesia. We landed in Jakarta, then travelled through Java via Bogor, Bandung and Yogyakarta to the volcano Bromo. After that we ended up in Lombok (having skipped Bali, which we were saving for the last 10 days of our holiday). 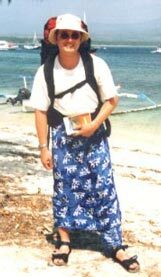 We had already heard from other backpackers about the Gilis (indonesian for "island") which lie north-east of Lombok. 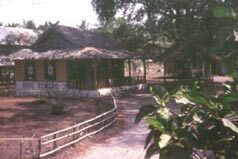 There are 3 Gilis: Gili Meno - the smallest of the three, Gili Air - nearest to Lombok, and Gili Terawangan - the largest and most frequented of the islands. All of the islands have fine white coral sand beaches and are surrounded by beautiful coral reefs (although I don't know to what extent they may have been affected by El Nino, of course). Sarah and I decided to stay on Gili Air..
and the journey was worth it just for that, and the snorkelling was quite nice, although the corals off Gili Air were much more beautiful. Another great thing was that we were given fresh pineapple after every snorkelling session, which got rid of the salty taste of the seawater. As evening approached, we reached Gili Air. We found a nice place to stay which, like most of the accommodation on the island, had a view of the beach, a little veranda and a hammock - perfect. Even the mosquito net didn't have any large holes. The island itself came very close to my idea of paradise. Nice people, good food, white beaches and as much pineapple and coconut as the heart desires. The reef around the island was very good for snorkelling. The best opportunities for snorkelling, however, were near the "harbour" on Gili Air, because there was a gap in the reef here. As the reef rose almost to the water surface it was a bit difficult to reach the beginning of the reef, except by trampling over the roof/top of the reef. Us ecologically-minded Europeans would never dream of doing such a thing, of course. The locals had fewer scruples and cheerfully gathered seaweed and sea urchins on the reef at low tide. The visibility, in comparison to Mexico, wasn't so great, but a visibility of between 15m and 20m was still enough to see all the colourful fish and corals. Wow - I'm really going diving! 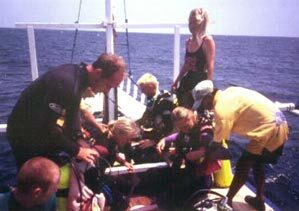 completely carefree, I went and signed up for a PADI Ressort Course. As I said, I have since heard a lot of negative things about these courses, but I have to say that this particular course was excellent. after which my head was spinning somewhat. But then I was immediately able to cool down a bit. We took the gear, went to the boat and sailed the 300m to the harbour to do the "pool" training. 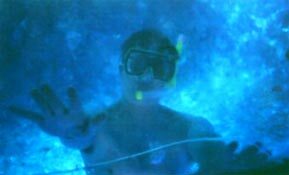 I don't think I have to tell anyone how absolutely amazing it is when you breathe under water for the first time - although I instinctively held my breath as I slowly sank below the surface of the water. My euphoria was slightly dampened when I succeeded in being stung on the hand by the only jellyfish for miles around (in fact the only one that I saw all week). Ouch, that really hurt! 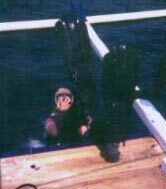 Here, too, the training was so good that a year later I was still able to do things like clear out the mask and retrieving the regulator. 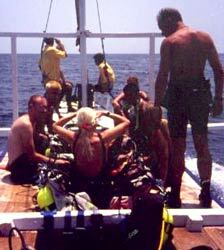 In the afternoon it was time - my first ever dive! 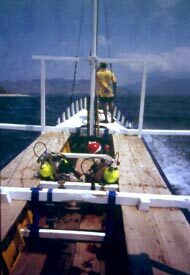 My instructor and I went to the boat with the other divers and sailed towards Gili Terawangan. I was a bit nervous and wondered how it would go. My instructor told me that she would control my buoyancy so that I'd be able to concentrate on the beauty of the underwater world. There was then a briefing with the other divers about the sequence of events/what was going to happen and what there was to see. After that we put on our equipment and went into the water. Of course I was completely overwhelmed at first. My instructor took my inflator and we slowly sank to the 10m limit. The first animal that I saw was one of the highpoints - an enormous turtle. Altogether we saw 7 turtles (or maybe the same one 7 times in different places! ), more than the other two groups. I felt safe the whole time and trusted that I was in good hands. The dive was over far too quickly, of course, and I was sad to have to go back to the boat with a fairly empty bottle after 40 minutes. It was a fantastic experience, and I'd like to thank Reefseekers once again for a great day. Last but not least, something about the dive center. 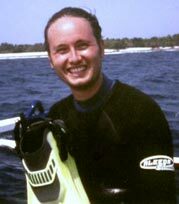 Reefseekers do a lot to help protect the ecol-ogy of the Gilis and try to awaken a sense of environmental friendliness in the inhabitants (without appearing imperialist). One of their concerns is the protection of sea turtles. To this end they have two small ponds where baby turtles are fed up until they are big enough to have a greater chance of survival. This programme is very successful (the German diving magazine Unterwasser has also written an article about it). 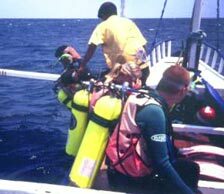 The fees for borrowing snorkelling equipment go to this programme. 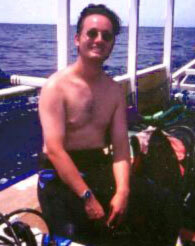 I really hope that, now that I can dive properly, I'll have the chance to return to the reefs with Reefseekers.